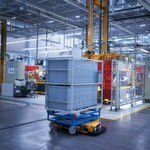 The importance of the open space segment for the Italian PV market may lessen in the future and in particular, the segment of small rooftop plants will in turn benefit from this. These changes are to be discussed by Italian experts on the 3rd PV Briefing & Networking Forum Europe in Verona, Italy on May 10th. The Italian PV market is currently facing strong changes within its segments. The importance of the open space segment is predicted to lessen while the segment of the rooftop plants increases. The reasons for these changes lie in several adjustments of Italy’s promotion scheme, the Conto Energia. This year, operators of plants in agricultural areas are being faced with strong cuts and the promotion for open space plants will also be abandoned in the second half of the year. This will therefore lead to an increase in importance for the small rooftop plants. One of the most important questions now arising for market participants is, how much of the volume of the previously, strong growing, open space segment can be compensated by the rooftop segment. Besides investors, the changes will also have strong influences on installers. In particular, small and local based installer companies, active in the rooftop segment are likely to benefit from this. The first networking event of the Joint Forces for Solar initiative in Italy focuses on the current shifts in segments of the Italian PV market. 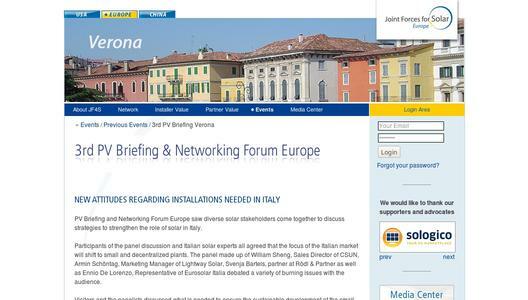 On May 10th, the 3rd PV Briefing & Networking Forum Europe will take place in Verona, Italy. The venue is the Grand Hotel Verona, from 5pm to 8 pm. In the first part of the event, experts will inform participants about the developments within the single market segments as well as possible future scenarios. During the second part, the panel discussion will be in focus. Participants William Sheng, Sales Director of CSUN, Armin Schöntag, Marketing Manager at Lightway Solar, Svenja Bartels, Partner at Rödl & Partner and Ennio De Lorenzo, Representative of Eurosolar Italia, together with the audience, will debate the possibilities and challenges facing PV installers, project developers, wholesalers as well as manufacturers, in 2012. The organizers of this event would like to extend their thanks to, premium sponsor CSUN, gold sponsor Lightway Solar as well as Rödl & Partner, Eurosolar Italia and media partners PV magazine, Sun & Wind Energy and PV-Tech.org as well as TV media partner SolarPV.TV. The networking event, 3rd PV Briefing & Networking Forum Europe, will be taking place on May 10th, 2012 from 5pm to 8pm. The venue is, the Grand Hotel Verona in Verona, Italy. Participation is free of charge. If you would like to take part in the event, please feel free to contact Mr. Daniel Fuchs (fuchs@jointforces4solar.com | +49 228 42966 45). Joint Forces for Solar is a global synergy of stakeholders along the solar value chain. It brings grass-roots knowledge and know-how to a global dimension. A local goes global strategy takes the first hand, insider information installers gain when dealing with customers on a daily basis and utilizes it to shape the future direction of the solar industry. In return, global goes local, installers benefit from access to information on the latest technological developments and changes in market trends giving them the competitive edge necessary for long-term success. The initiative builds a bridge between the individual links of the value chain and offers a platform where opinions, ideas and expertise can be shared that ultimately strengthen the industry going forward.